It’s estimated that there are 252,000 construction sites across the nation on any given day. Just picture them. Towering apartment buildings climbing toward the sky. Highways being reconstructed. Homes being expanded, and shimmering office buildings being renovated along busy city streets. These impressive projects bring us safer, newer, and better places to live and work, yet they are some of the most dangerous areas we encounter on any given day. The Occupational Safety and Health Administration (OSHA) reports that in 2015 alone, 4,836 construction workers were killed on the job, an average of more than 93 per week, or more than 13 deaths every day. On-site workers are not the only individuals at risk of a catastrophic injury or fatality, however. 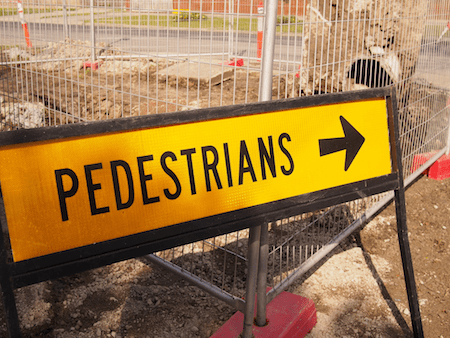 One law firm estimates that upwards of 100 pedestrians are killed each year in the United States due to accidents occurring at construction sites, and many more are seriously injured. The firm reports that most pedestrian construction accidents occur when a bystander is struck by a falling object, or by a construction vehicle such as a crane or truck. The possibility of a pedestrian bystander being the victim of a construction site injury is complicated when the pedestrian is a senior citizen or an individual who has a disability such as vision or hearing loss, or a mobility issue that make navigating potentially hazardous conditions that much more difficult. The Americans with Disability Act (ADA) protects the rights of the disabled, and outlines requirements for construction sites to help keep disabled bystanders protected from injury. By following the recommendations of the ADA, as well as recommended safety protections established by national safety organizations, the risk of a pedestrian injury at a construction site can be mitigated. Also, there are safety precautions that seniors, disabled adults, and their caregivers should take anytime they are traveling in or around a construction site or roadway work zone. 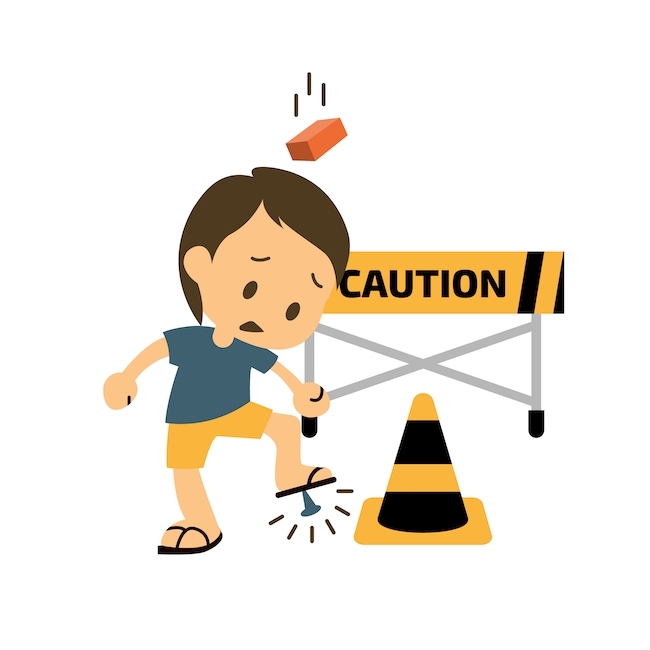 The greatest risks for pedestrians on foot include falling objects, being hit by a construction device, and slips and falls. Avoiding a construction area altogether is the safest scenario. However, when avoidance is not possible, follow the guidelines below to safely navigate the construction area and mitigate your risks of an accident or injury. One of the biggest hazards to pedestrians traveling near a construction zone on foot is the danger of falling debris, such as nails, tools, construction materials, or even scaffolding. One of the most effective ways to protect yourself from falling debris is to walk as far away from a construction site as possible. If you can walk on the opposite side of the street as the construction project to maintain the greatest possible distance. If you know your daily commute will take you past an ongoing construction project, consider temporarily changing your route to minimize risk. Construction sites located in a city or residential areas where pedestrians will be commuting are encouraged to put up temporary barriers such as fences to expand the distance between bystanders and possible falling debris. Such boundaries should include posted warning signs that communicate the construction area should not be entered, or that the sidewalk is closed. If you see a fenced-in area and are unsure the purpose of the barrier, look for a construction zone warning sign. Never attempt to cut corners or avoid crowds by maneuvering inside barriers. Not only are the interior areas of designated construction zones highly dangerous places that require the use of hard hats, but they also pose trip and fall risks. The risks are especially great for individuals with limited vision or mobility when construction debris, uneven surfaces, or even dangerous holes caused by excavations or trenches are present. In addition to barriers intended to keep pedestrians out of construction zones, depending on the location of the project and its proximity to traffic, a construction area may also utilize channelizing devices or crash-worthy barriers that protect pedestrians from traffic. If such devices are detected, do not attempt to enter into the road with traffic to avoid pedestrians or expedite your commute, especially if you suffer from a mobility or hearing impairment. Objects of any weight or size that fall from hundreds of stories up in the air become extremely dangerous hazards. A New Jersey construction worker was reportedly killed by a tape measure that fell 50 stories from a high-rise construction project. It’s important to know the risks of falling objects and to keep a vigilant eye out for overhead construction when passing near a construction site. Understandably, the disabled need to be extra cautious. 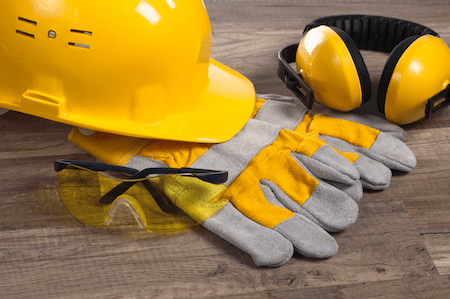 If you are someone with a vision, hearing, or mobility impairment and live near a construction site, or if commuting past an ongoing project is unavoidable, consider investing in a hard hat as an added safety precaution. If you have a hearing impairment, be sure to look all around you, including up, as you walk through a construction zone. If a construction worker drops an object, you won’t be able to hear their warning cries, which means it is essential to be hyper-vigilant about scanning the surrounding area. Construction projects often require the re-routing of pedestrian traffic. Sometimes, detour pathways are created that require pedestrians to traverse roads and surfaces that are unpaved or uneven. There could even be areas where the sidewalk or road has been broken, cracked, or partially removed, resulting in an uneven surface that may be slippery with dirt or dust. Visually impaired individuals should take extra precautions through this area to detect changes in the surface they are about to encounter. Another primary factor that could cause construction area-related trips or falls are slippery, or muddy surfaces. Water is often used during construction projects for a variety of purposes. Whether the construction is taking place indoors or outdoors, watch not only for surfaces that appear to be slippery but other indicators of water use. Such indicators may include clearly marked “slippery surface” warning signs, or the presences of pipes or hoses. Seniors and those with mobility issues should proceed through these areas slowly, and with assistance whenever possible. Large vehicles and heavy earthmoving equipment including excavators, wheel loaders, and dozers used in construction zones could pose safety hazards to pedestrians. If you have a hearing or mobility issue and will be passing by such equipment, make sure the operator of the equipment can see you, and stay in visual contact with the operator as you pass for your safety. It is recommended—though not required—that to assist the visually impaired to safely navigate temporary traffic control areas, that guidance is provided by devices that project recorded, spoken messages. Devices exist that speak in response to detected pedestrian movement, push button controls, or as a timed, repeated message. While not all construction zones will utilize such devices, seniors and the visually impaired should be aware that they may encounter such spoken messages and should follow any spoken instructions for greatest safety. Researchers at The University of Minnesota are working on an app to help the visually impaired better navigate construction zones. Click here to learn more. It is recommended that warning signs about temporary traffic control zones be posted well ahead of the construction zone to allow pedestrians enough time to take an alternate route. The hearing impaired, and those with mobility issues should watch for such signs and read them thoroughly. Warning signage may provide such information as the location of temporary ramps, where the construction zone will end, if transportation buses are available to assist pedestrians, and whether alternative routes are available. In construction zones, it’s required that a continuous edge that can be detected by a cane be present along temporary pathways. If you are walking with a cane or walking stick and know you are navigating a construction zone, search for the edging to help guide your path. The visually impaired should also be aware that at times during construction projects, sidewalks may not have installed raised curbs. These indicators are often essential for the visually impaired to indicate where sidewalks end and roads with traffic begin. Listen for sounds of traffic, audible cross walk messages, or ask for assistance to avoid entering the road when traffic is oncoming. Click here for more tips on pedestrian safety in a work zone from the National Work Zone Safety Information Clearinghouse. While construction zones are required and encouraged to establish temporary accommodations for seniors and disabled adults reliant upon wheelchairs, hazards may still exist that could make navigating the site in a wheelchair dangerous. Follow the tips below to mitigate your risks. It’s recommended in construction zones that workers put up barriers around all equipment, tools, and building materials and that all debris be placed in a dumpster at the end of the day. It’s possible, however, that at a disorganized construction site, such items may be littered around the base of the project, causing a safety hazard for pedestrians. If you have limited mobility and are traveling by a construction site in a wheelchair or scooter, avoid areas that appear to be littered with debris—even if it looks like an attempt was made to clear the area. The sidewalk could still have collected sharp objects such as glass or nails that could puncture a tire. Keep as wide a distance as possible around the construction zone, crossing the street to avoid corners and areas that appear to be cluttered with construction materials, whenever possible. As mentioned previously, construction projects may result in uneven, or unpaved surfaces. Individuals who utilize a wheelchair or scooter should understand the limitations or capabilities of their mobility assistance device. If you are uncertain how your wheelchair or scooter will perform on varying surfaces, avoid the area as thoroughly as possible. Construction areas are encouraged to install temporary curb ramps to assist the disabled to navigate the area. If you utilize a wheelchair, look for, and use the available curb ramps to avoid dangerous navigation scenarios caused by uneven, or abnormally high curbs. Be advised, however, that temporary ramps may be unsteady or wobbly, or they may not have an adequate side guard rail attached. Exercise caution while traveling up or down any temporary ramps. Temporary ramps or pathways designed without an adequate bottom barrier protection may allow for mud to flow over the surface of the ramp or path during wet weather, causing a slippery surface that may be difficult—or impossible—to cross in a wheelchair. Look ahead and if it appears that the path or ramp you need to traverse is muddy, consider an alternate route. A construction area may establish an alternate pathway for pedestrians for use throughout the length of the project. Be aware, however, that some pathways may not have been designed to accommodate wheelchairs or motorized scooters. As a result, the turns or turnarounds may be too narrow to comfortably navigate in such a device. Look ahead while traveling through a temporary pathway. If it appears that a turn ahead will not accommodate your wheelchair, consider taking an alternative route to reach your destination. During a five-year time period, more than 4,400 individuals died in work zone crashes. Of those, 85 percent of victims were the driver or passenger in the vehicle. In addition, 200,000 individuals were injured. Follow the tips below to learn how to safely drive through a work zone, particularly if you suffer from a disability. Construction sites often require the rerouting of vehicle traffic to accommodate the work site’s footprint and/or equipment. When such unexpected traffic pattern shifts appear in familiar areas, in unexpected times, it can lead to confusion, especially for seniors whose reaction times may be slower than the average driver. When a traffic pattern is rerouted to accommodate construction, it’s recommended that the construction crew post signs ahead of the altered roadway to give drivers enough time to anticipate the change and react accordingly. This may include changing lanes, preparing for a traffic merge, or positioning their vehicle to exit from a different lane. When you see a traffic pattern alert sign, slow down while remaining at a safe speed. Clearly study the sign, and plan accordingly. 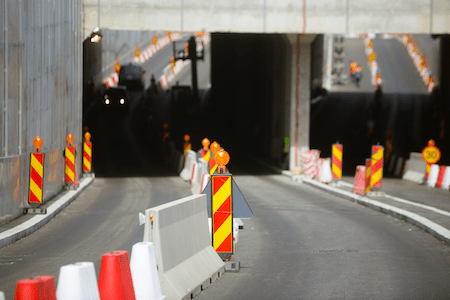 If you anticipate driving through a construction zone during rush hour, consider altering your route altogether to avoid a potentially hectic and confusing situation. In addition to signage, a construction zone may use non-visual cues, such as rumble strips, to alert drivers of changing traffic patterns. If you sense rumbling under your tires, scan the immediate area for signage, or look ahead to attempt to detect a construction zone or traffic pattern shift. Such cues are particularly important for the hearing impaired, who may not be able to detect the sounds of road construction, such as drills, motors, or jackhammers. Construction zones typically post slower than normal speeds. Be sure not to exceed the temporary speed limit. A vehicle traveling 60 m.p.h. travels 88 feet per second. This means if you’re traveling 60 m.p.h. and signage indicates that road work will take place in 1500 feet, you’ll reach the work zone in only 17 seconds. Seniors in particular who have slower reaction times are encouraged to drive slowly, but safely. Sometimes, especially when construction is being done to major roadways, a road or highway requires the complete detouring of traffic. When this occurs, signs must be posted all along the detour route to guide motorists until they re-enter their intended course. Such detours can be stressful as motorists now driving in unfamiliar areas worry that they will get lost or miss their next detour direction. Proceed slowly but safely through the detour route and constantly scan the right side of the road for signage. Detour signage should reflect the name of the highway or street being detoured, plus an orange detour sign and an arrow indicating which way to travel in order to remain on the temporary route. By following the directions displayed along the route, you should safely arrive back on your intended roadway. If you are aware of roadway construction and a possible detour, plan ahead to take a different route. Be advised that sometimes due to roadway construction or detours, a highway entrance or exit may temporarily be closed. Detours should be set-up to allow motorists to reach their ultimate destination. Before you reach your intended highway entrance or exit, begin scanning the side of the road for signage that indicates the exit is closed. The detour may need to be taken before, and not after, the closed exit or entrance. Sometimes, when construction requires detour routes on high-speed highways, the road crew may use police vehicles to draw motorists’ attention to detours and lane or entrance/exit closings. Police vehicles may be situated near the diverting area with warning lights flashing. If you see such a positioned vehicle, safely slow your speed and scan the area for other signage or indicators that a detour or roadway rerouting is taking place. In a construction zone, traffic may be temporarily rerouted, or lanes may be shifted to avoid work areas or unsafe road conditions. To reroute traffic or create temporary lanes, channelizing devices or orange traffic cones may be utilized. Follow the traffic pattern and stay within the temporary channelizing devices. It may be confusing when the devices seem to be rerouting you in an unfamiliar way, however attempting to divert the traffic pattern indicators could take your vehicle into an unsafe area. Also, be aware that traffic patterns may change daily to accommodate road construction. Even if you commute on a road daily, know that the traffic pattern at any given time may not be what you expect, so watch for signage and channelizing devices. Sometimes, especially on slow moving roadways, instead of channelizing devices, flaggers may be set up to control the route and pacing of two-way traffic. Always follow the directions of flaggers, and be sure to keep a safe distance for their safety, and your own. Never speed past flaggers. Flaggers hold the same authority as a regulatory sign, which means you may be cited for disobeying the flagger’s directions. In addition, pilot cars with “follow me” signs may be used to safely usher rows of cars through lengthy lane shifts. Follow the pilot car’s instructions at a slow, safe distance. Be aware that there may be places within a construction zone where lane changes are restricted. Plan ahead to position your vehicle in your necessary entrance/exit lane early. Before changing lanes, scan the area and check your blind spots for slow moving traffic, road barriers, construction workers or equipment, or other unexpected traffic patterns. Barriers should be set up in a construction zone to keep vehicles at a safe distance from workers, unsafe surfaces, and equipment. Still, without the risk of driving your vehicle into another lane, a soft shoulder, or another unsafe area, keep as safe a distance as possible from construction workers and equipment. You may observe construction debris such as dust, sparks, or water as you travel past the construction area. Be aware of the appearance of such items, however, do not be alarmed. If you are traveling within the created temporary channelizing devices, you should not be in any danger. Even the most experienced road crews can suffer accidents on-site. As you drive through a construction area, make sure you are traveling at a safe speed that does not exceed the posted speed limit. Be aware that a temporary speed limit may be set in the construction area that is slower than the speed you are used to, and understand that fines are usually doubled for speeding in a work zone. Scan the area aggressively to watch for debris, workers who may slip and fall, or construction equipment traveling outside of the barricades. Also, be aware that workers, construction equipment, or vehicles may enter your lane unexpectedly. Scan the area around you to remain aware of such unexpected occurrences. If you see an accident about to occur, you may not be able to avoid it. The best thing you can do is to slow your speed, scan your surroundings, and minimize the use of distractions such as the radio, maps, GPS devices, food, and cell phones. Then determine if you can safely navigate away from the impending accident without entering another lane, a soft shoulder, or an unsafe area that could also put you at risk. Rear-end crashes are the most common type of work zone crash. Be prepared for vehicles in a work zone to travel at slower than usual speeds. Remain calm, and resist the temptation to tailgate, even if you feel the traffic is progressing slowly. Also, be aware that at any time, a car (or cars) ahead of you may need to unexpectedly reduce their speed, or stop. Remain vigilant and watch for brake lights and signs of reduced speed as you travel through the work zone. Even if you are traveling during the day, it’s best to drive with your headlights on while traveling through a construction zone. Not only will your headlights alert vehicles and construction workers around you to your presence, it will help you to detect potential road hazards such as debris or uneven surfaces. A Road Work Ahead Sign­ ­– Indicates road work is occurring a short distance ahead, and drivers should be prepared for unusual driving conditions. Two Way Sign ­– Indicates that traffic will be traveling in both directions in an unexpected area. Watch for oncoming traffic. Merge Sign – Indicates that a lane is about to end, and you will need to merge into the adjacent lane. Flag Man Sign – Indicates that a flagger will be positioned ahead to direct traffic. Be prepared to slow, stop, and follow directions. Detour Sign – Indicates that a detour is a head. Plan to be rerouted and follow the detour signs accordingly to reach your intended destination. End Road Work Sign – Indicates the road work has ended. At this point, you may resume your normal speed and safe driving practices. Click here for more construction zone safety tips for motorists from the U.S. Department of Transportation Federal Highway Administration. Immediately seek medical attention if necessary. Call 911 if you don’t feel you can safely take yourself to obtain medical care. If you are unsure if you should seek medical attention or not, always be cautious and seek care. Your injuries may be worse than you initially suspect, especially if you have been struck on the head by a falling object, or have been rear-ended. You could have a concussion, or whiplash, the symptoms of which may appear or exacerbate over time. If an accident occurs, the construction company may be at fault for not exercising proper safety strategies and may be liable to compensate you for medical costs, or costs associated with personal losses, such as damage to a vehicle, wheelchair, or other belongings. If you believe you may be eligible for compensation, seek legal representation, and obtain the counsel of a qualified legal resource. If you decide to pursue legal representation in the future and seek compensation for your losses, you will want to document the conditions that led to your injury. If you suffer from a mobility or vision impairment, ask a friend or family member to assist, or a bystander or witness at the site. Again, if you decide to pursue compensation, you will likely need to have your story corroborated by witnesses at the scene. Ask any witnesses if you can record their contact information and if you may have their permission to contact them in the future if you decide to seek legal counsel. As soon as you are able, document detailed notes of everything that you remember that led up to the accident, including posted signs (or lack thereof), the conditions of the work site relative to signage, barricades or channelizing devices, the presence of construction equipment or workers, uneven or slippery surfaces, detour signs or flaggers, etc. If you have difficulty remembering the details, especially if you suffer from cognitive recall difficulties, ask a witness for assistance. A lawyer will want to know how you have been physically impacted by the accident, so make notes of symptoms or impairments that you face that are directly related to the accident. If you decide to seek financial compensation, keep track of all monetary losses. Remember, this could include medical bills, replacing equipment such as a wheelchair, auto repairs, and lost wages from time off of work to recover from injuries. To understand the precautions that construction sites are legally required to take, and are advised to take, to keep you safe, it’s important to start with an understanding of the Americans with Disabilities Act (ADA). The ADA was established by Congress in 1990. It is a civil rights law that give Americans with disabilities the same protections as the Civil Rights Act of 1964. The ADA defines a disability as “any physical or mental impairment that substantially limits a major life activity.” This definition encompasses such activities as seeing, hearing, walking, and communicating. The ADA requires equal access to all pedestrians, including those living with a disability, to all completed, publicly accessible transportation facilities, as well as during construction projects. The U.S. Access Board is a federal agency committed to accessibility for Americans with disabilities. It develops and maintains the ADA Accessibility Guidelines or ADAAG. ADAAG has established design criteria for construction and transportation systems and outlines minimum accessibility requirements for construction areas. The Access Board has also drafted guidelines considered to be best practices that regulate pedestrian facilities within the public right-of-way. The guidelines, known as the Proposed Right-of-Way Accessibility Guidelines (PROWAG), were published in the Federal Register in 2005. Click here for more information on the requirements for accessibility in temporary traffic control zones from the ADA. What follows is a list of some of the required construction zone safety standards to help keep pedestrians of all capabilities safe throughout the duration of a construction project. All traffic control devices must comply with standards set forth by the Federal Highway Administration’s Manual on Uniform Traffic Control Devices (MUTCD) as well as any state agency requirements. Such devices include cones, barrels, barriers, and signage. Channelizing devices used to close sidewalks should run the entire width of the sidewalk with no gaps. Tape, barrels, or traffic cones should not be used, as they create gaps. All personal protective equipment (PPE) used by construction works must meet or exceed standards set by the American National Standards Institute (ANSI). Clothing must be highly visible and include reflective materials, especially for crews working at night. Existing pedestrian pathways must be maintained if sidewalks can remain open during construction. In compliance with MUTCD and ADAAG guidelines, add any necessary warning signs or modifications. If the current pathway must be closed, develop an alternative pedestrian pathway that is parallel to, or easily reached from, the existing pathway. MUTCD advises that to assist pedestrians, especially the visually impaired, a continuous detectable edge should be erected along the temporary pedestrian pathway. According to the MUTCD, the detectable edging should protrude at least 6 inches above the surface of the pathway, with the bottom of the edging being a maximum of 2.5 inches above the surface. Edging should be continuous except where pedestrians or vehicles will be turning or crossing. Detectable edging should be orange, white, or yellow and should match the color of adjacent channelizing or traffic control devices. Edging should be firmly attached to the ground or other devices. Temporary curb ramps should be provided to enable pedestrians to negotiate curbs safely where needed. Temporary curb ramps should be the full width of the temporary route and are recommended to be 60 inches wide with a minimum width of 48 inches. All temporary ramps should be firm, stable, with a non-slip surface, and should be able to withstand the weight of pedestrians, wheelchairs, and scooters. Ramps should have defined edges and be color contrasting to assist the visually impaired. In compliance with MUTCD, when exposed to vehicular traffic, crash-worthy barriers and channelizing devices should be used to protect pedestrians. All temporary pathways must maintain a minimum width and a smooth surface to avoid increased risks of trips and falls and to minimize barriers to wheelchair use. Build a transportation management plan that includes a temporary traffic control plan to protect workers, pedestrians, and motorists. Set up boundaries using fences or other temporary barricades to keep unauthorized pedestrians out of construction areas. Post signs on the boundaries to deter curious pedestrians. Work zones that impact traffic should consist of an advanced warning area with signage that notifies motorists of upcoming traffic pattern changes, a transition area that utilizes traffic control devices for proper channelizing, a buffer area, the work zone, and a termination area with proper signage indicating the road work has ended. Click here for more best practices for maximizing driver attention in work zones from the Joint Transportation Research Program. Utilize safety devices to protect pedestrians from falling objects. Such devices may include sidewalk sheds, netting, and chutes. Do not store dangerous materials such as construction tools, equipment, or building materials out in the open or too close to the edges of construction sites. Keep them inside protective barriers. Items that should be discarded at the end of the day should be placed in closed dumpsters and not left in public spaces. To aid the visually impaired and guide them through temporary traffic control areas, utilize devices that offer audible messages and instructions. During the construction project, consider making a guide available to disabled persons that help them safely navigate temporary traffic patterns and pathways. The Federal Government strongly encourages states to provide either audible warnings or physical maps at work zones to assist the visually impaired. Avoid placing temporary curb ramps near drain covers or grills so as not to impede disabled pedestrians utilizing wheelchairs or scooters. Also, avoid placing ramps near drainage collection areas to mitigate the chance of hazardous puddling for those utilizing canes or walkers. Click here for more construction zone safety tips from OSHA. Construction projects keep communities moving forward and help us maintain the integrity and safety of roadways, buildings, and public areas. Still, they pose serious risks to workers and pedestrians, especially those who are already suffering from age, or birth-related disabilities. By remaining vigilant, taking detours when possible, and understanding the risks, all pedestrians, regardless of their physical limitations, can mitigate their risks of a construction-related accident or injury.